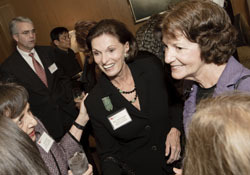 WFPG membership is open to individuals, companies and organizations experienced in international affairs and committed to global engagement and the promotion of women leadership in international affairs. Our unique combination of programming and leadership development activities allow our members to continually enhance their knowledge and contacts in this fast-changing field. Members are drawn from across the international affairs community and include representatives from international organizations, the government, and the corporate, non-profit, diplomatic, and media sectors. Support WFPG in our mission to promote women's leadership and voices in foreign policy by becoming a member. WFPG is a 501(c)(3) nonprofit and all memberships and contributions are fully tax-deductible to the extent allowed by law. All WFPG memberships are for the calendar year. Join today and begin receiving the benefits of membership! Receive all of the benefits above as an individual member or join us as a Leadership Circle member to show you support! WFPG also offers options for non-profits, embassies, and organizations who want to support WFPG and offer benefits to their staff.